Caught a show on television featuring noise pollution in the Philippines. 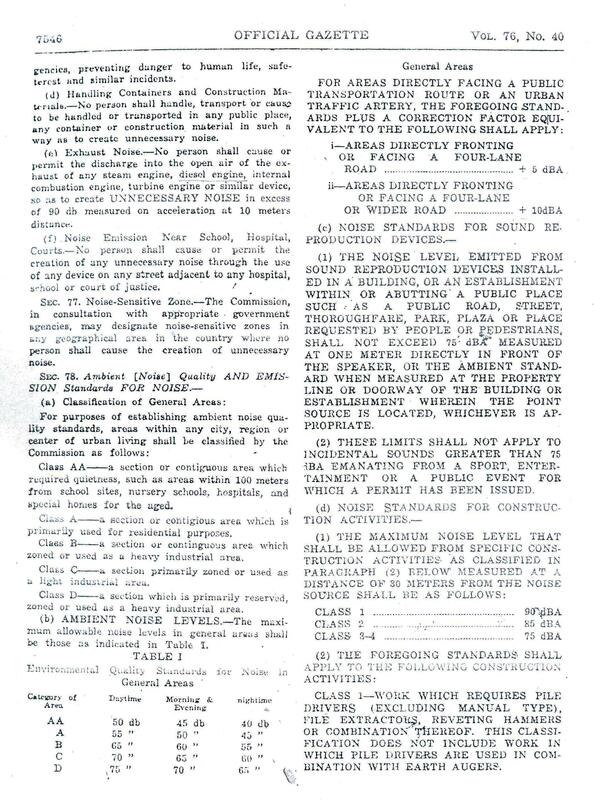 The feature on noise included the reporter accompanied by a person who measured ambient noise using a portable noise meter.The results were quite interesting if not surprising, including the alarming measurements inside a high school classroom at a building beside EDSA. There was also the segment where hearing damage was covered, particularly those derived from workplaces (e.g., factories). Of course there are many sources of noise, but it seems that much of it nowadays is associated to vehicular traffic (e.g., tricycles, trucks, etc.). Nevertheless, we often disregard a lot of the other sounds around us because they are part of what we hear everyday and we have gotten used to them. To be able to appreciate the totality of the sounds (noise) that we often disregard, much is actually eliminated when we have blackouts. That means no TV, no stereos, no electronics that produce sounds that we take for granted. 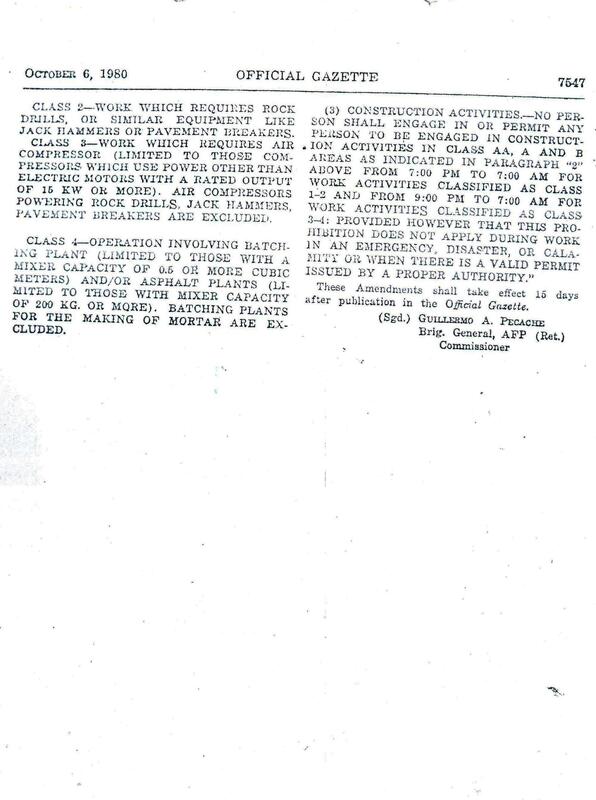 I reproduce below the three pages of what was the National Pollution Control Commission’s Memorandum Circular No. 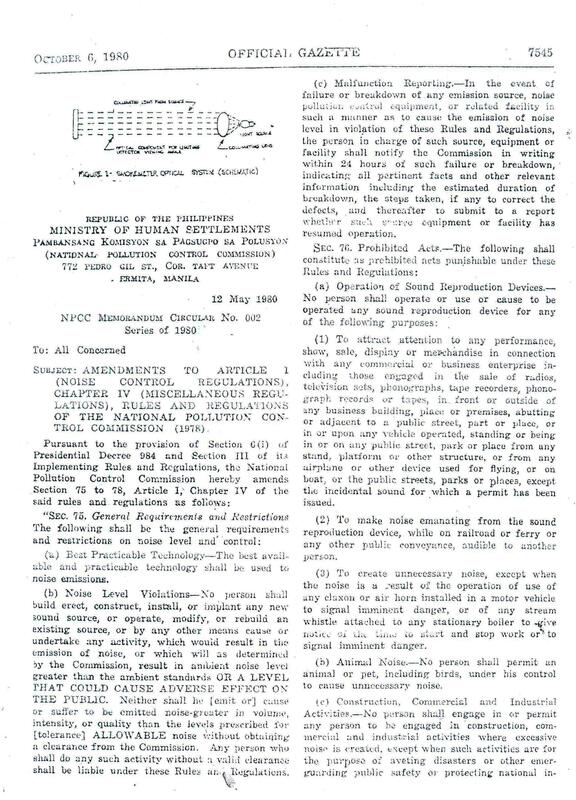 002, Series of 1980, as published in the Official Gazette of the Republic of the Philippines, which until now serves as the basis for noise standards in the country. Recent initiatives led by the DENR’s Environmental Management Bureau seeks to update/revise these standards and a draft has been circulated to members of an inter-agency committee and industry. Perhaps our local governments could take a look at laws that are often set aside in part because of a lack of instruments to be able to quantify noise. I think curbing noise pollution should significantly improve our quality of life and would have positive impacts to our health. Perhaps the material above should serve as a basic guide for local governments and private citizens in monitoring noise. People should be knowledgeable of what can be considered as unacceptable. We have never been known to understand and appreciate the concept of externalities such as those from congestion and emissions. So the next time your neighbor decides to go on a karaoke session or revs up his motorcycle, you have a basis for making a complaint and maybe even using the memo for reference in your barangay!